Our production philosophy blends a deep respect for time-honored, traditional production techniques with New World creativity, ingenuity and innovation. We distill our spirits on a vintage, direct-fire, 2,500-liter Charentais-style alembic still – one of only a few operating in the United States. The process is laborious and slow and requires significant patience, skill and attention-to-detail. The results, however, are spirits and liqueurs of uncompromising quality, balance and depth of flavor. Direct-fire adds layers of depth and complexity of flavor – much as with grilled food. Distilling “Low and Slow” – where a single distillation can take upward of 12 hours and a complete distillation cycle (three ‘broullis’ distillations + one ‘bon chauffe’ distillation) requires upwards of 48 hours – maximizes our ability to separate out the crude portions of the distillate and to concentrate flavor. 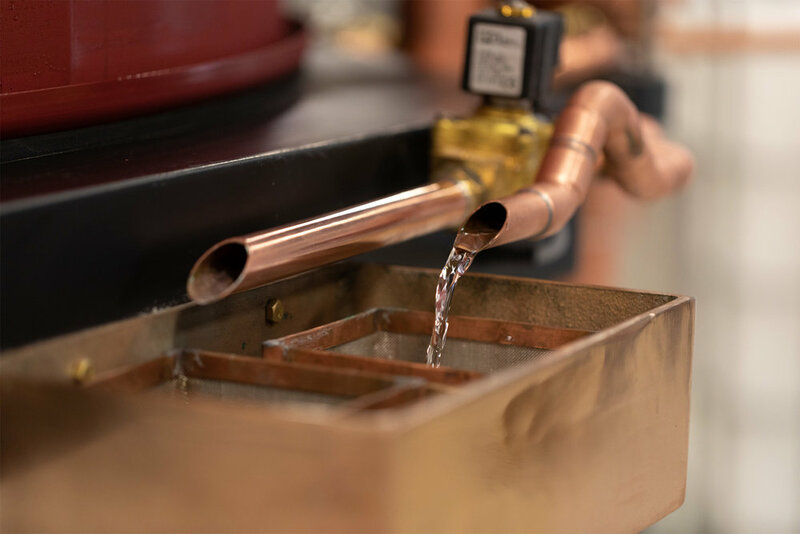 Glycol-chilled water cooling allows for precise control over the temperature of the final distillate, providing for a smoother, more aromatic product. Extraction - Aging spirits extract fatty acids and phenols from the barrel, with different compounds being extracted over time as the cellular structure of the wood breaks down. 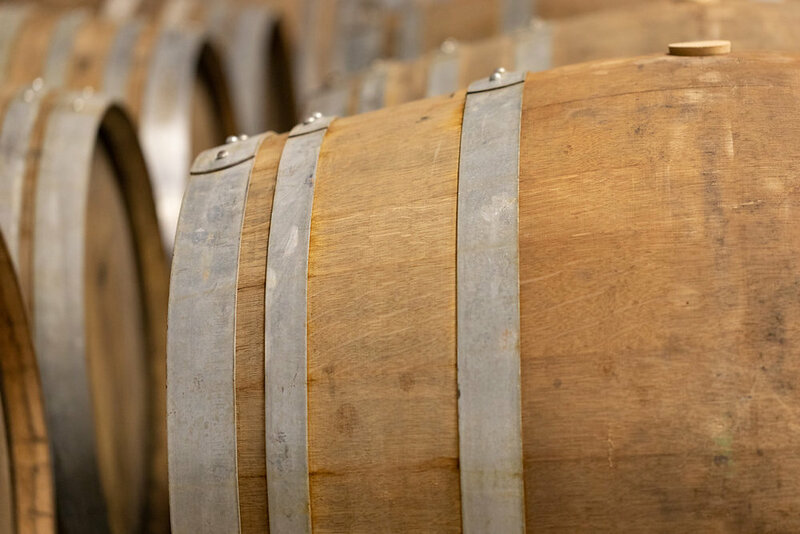 The humidity and temperature of the storage area and the type of wood, its terroir and its char play defining roles in determining the character that the barrel imparts upon the spirit. Esterification - Over time, acids and phenols bond to alcohol, forming highly desirable fruity, aromatic esters. Longer aging creates longer ester chains that produce the sweet honey, floral and tobacco flavors often present in the highest quality spirits. Concentration - As a barrel breathes over time, a portion of its contents evaporates (the “Angel’s Share”). What remains in the barrel benefits from concentration of flavor. "resting months, years, or decades can transform a spirit into something remarkable." 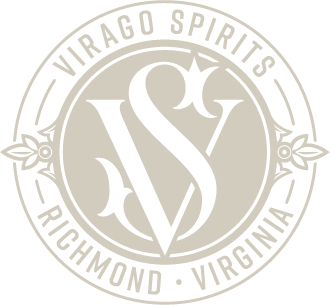 Following aging, Virago Spirits will provide selected products with an additional twist to produce a variety of creative product interpretations. While long-term aging is intended to provide a transformational impact upon a developing spirit, brief storage in finishing barrels offers subtle flavor flourishes just prior to blending and bottling. We will utilize a variety of barrels, such as port, Tokai, and red wine, to finish our products. As rum is a hand-crafted, agricultural product, distilleries large and small must contend with the fact that, even with a consistent recipe, flavor profiles will vary from season to season, batch to batch, barrel to barrel. In order to achieve consistency out of inconsistency, producers blend final products from selected individual barrels, taking what they need from each in order to achieve a specific flavor profile. This process also feeds a secondary market where unique releases and creative new blends can be imagined. It is here that we were able to begin with a blank canvas and craft a world-class, aged rum that transcends traditional definitions and classifications: Virago Four-Port Rum. Additional products and creative blends will be released as our distilled spirits mature.